Ireland's Sam Bennett came out on top of a sprint finish to win stage 12 of the Giro d'Italia. The 27-year-old won his second stage on this year's tour at the Imola racing circuit in Northern Italy. 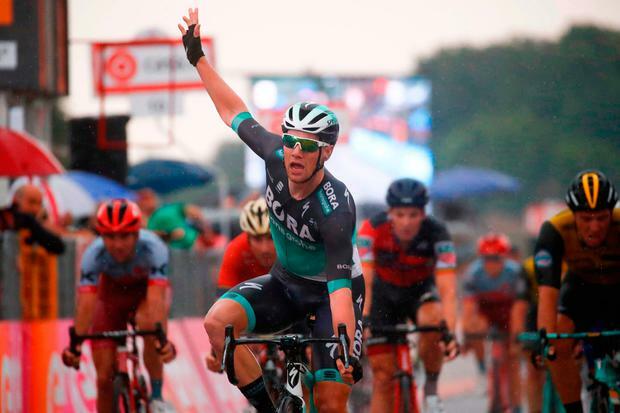 Bennett had already registered a victory in this year's Giro D'Italia with his win on stage 7 - Ireland's first since 1987 - and the Irishman topped the podium again in a sprint finish after a 214 kilometre ride in poor conditions. Britain's Simon Yates maintains a 47 second overall lead with nine stages of the tour remaining.